Garden Towers is seen in the drone shot at the vey bottom. It is about 38 units. The owners manage it themselves. Notice on the roof is the garden. On each corner is a Bar B Q. It has a gazebo and several places to just hang out. The roof can be reserved. Their is a variety of units and floor plans and some are terrific. Canyon Road Towers is to the right in the photo. It is larger, 185 units, and very popular. It has an indoor swim pool and exercise room. It has two social rooms. It has tennis courts. It is well managed. Some of the units are in original condition and some are remodeled. Some of the views are spectacular. Zion Summit is directly north of temple square, two towers behind the LDS conference center. The swim pool is outdoors. It has a large entry which invites socializing. Zion Summit seems to encourage socializing, even has a social committee. 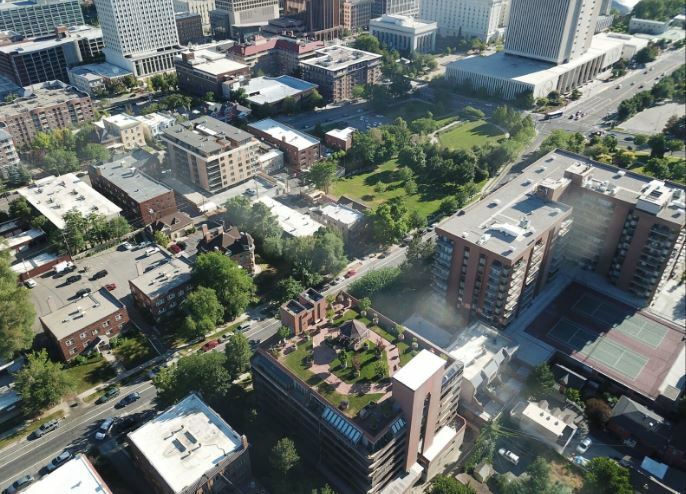 All three of the buildings are popular for the easy access to temple square and City Creek Mall. American Towers, South of City Creek, is very popular with those that are wanting a downtown city feel. Theaters are next to it as well as great places for eating out. Its rooftops are a great place to entertain and hot tub with a view. It is large enough to afford full time security. It has racquetball courts. Terrace Falls is on 3rd Ave directly behind Garden Towers. The facility has a shop to die for. Some of the floor plans are great for people wanting two master bedrooms. Terrace Falls is a terrific property. Trevi Towers abuts Zion Summit. Most of the floor plans are large and the units facing South have wonderful views. It has an indoor pool. This website has great search engine. I invite you to search in the search bar or to take advantage of the quick and useful links searches which I have established. Some are by building and some by location. I enjoyed it when one of my colleagues called me “the condo king”. I have sold condos from North Ogden to Daybreak. Selling condos is not like selling houses. I you to encourage you to choose me in helping you buy or sell a condo. This link goes to the category that pulls up all of the articles I have written about condos: click here. Clicking the link above opens up a spreadsheet that I created for one of the downtown Condominium Home Owners Associations. (HOA) They were interested in comparing the fees and what they cover of other associations. Not all condominium projects are listed in this spreadsheet, but many of those downtown are included. If you are moving from a house to a condominium you will probably discover that the costs add up to be quite similar to what you are now paying. Benefits that you can’t really monetize is the convenience of not having to maintain a home; yard work, snow removal, building maintenance, etc. You do give up total control which led to an article, “Welcome To The Condominium Project”. Six Popular Downtown Salt Lake City Condominiums. There are more and I have links to many on this site and more coming. But I call these the “big six” because I find them the most popular with my buyers. Below the photo are links to commentary and the ability to quickly search for listings that are currently for sale in these properties. When clicking those links the search results will possibly include nearby condos of similar details. NOTE: Quick Searches are also available in the “properties” drop down in the menu bar. Often additional Close by properties appear in the search results. Close to downtown. Secured/covered garage parking with direct access to elevators. Building amenities include large common room with adjoining kitchen, pool hot tub, exercise room with a great selection of equipment, pool tables, and wood shop. 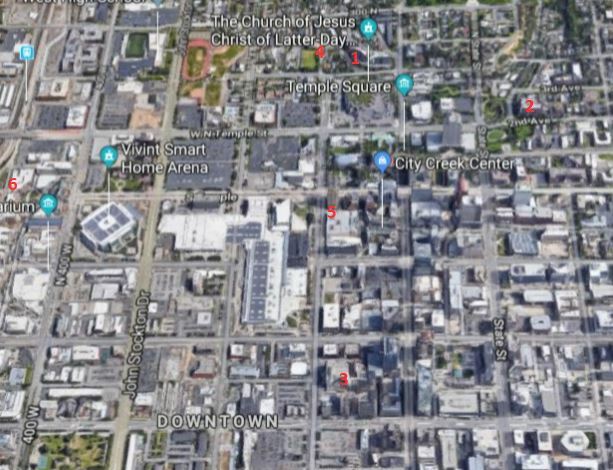 Perfectly located within walking distance to Temple Square, Memory Grove Park, Bonneville Shoreline Trail, Downtown Salt Lake City, and City Creek. 5th floor has pool, excercise room, sauna, library. Workshop with woodworking tools is on the main floor.